Hello everyone! How are you today? I'm STILL waiting on the snow to arrive. We (my kids and I) want a snow day so badly! Dad does not...because that means the power will probably go out and he will be working! I'm still recovering from a head cold, but I did make a Tuesday's Tip video today. My voice sounds a bit stuffy...but here it is! I hope it inspires you to try a new technique! 5 1/2" x 8 1/2". The first mat is Glossy White cardstock, measures 4" x 5 1/4" and is colored with the Light & Dark Pineapple Punch and Calypso Coral Stampin' Blend Markers. Spritz the cardstock with rubbing alcohol and emboss with the Dot to Dot embossing folder when it dries. The Calypso Coral mat is 3 1/8" X 4 5/8" and has a 3" X 4 1/2" piece of Happiness Blooms designer paper on top. 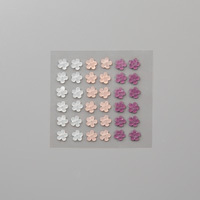 Next is a 1 5/8" X 4 5/8" piece of Whisper White cardstock with a 1 1/2" X 4 1/2" piece of Happiness Blooms designer paper. Both of these are attached to the card base with dimensionals. I tied a piece of Calypso Coral Satin Ribbon in a knot and added five (odd numbers are more appealing to the eye rule) flowers from the same designer paper that have been punched with the Bitty Blooms punches. Isn't it a FUN, BRIGHT and CHEERY card?!?! And now...it's snowing! Thanks so much for stopping by today! Have a FANTASTIC rest of your day! Stay warm, dry and SAFE...if you're in a storm area! Come back tomorrow for more CREATIVE INSPIRATION! !